The Viking by C. Graham. 1893. In 1892, Norwegian Magnus Andersen embarked on an ambitious project – building a full-size replica of the Gokstad Viking ship that had been discovered 12 years earlier in a burial mound near Gokstad, Norway. 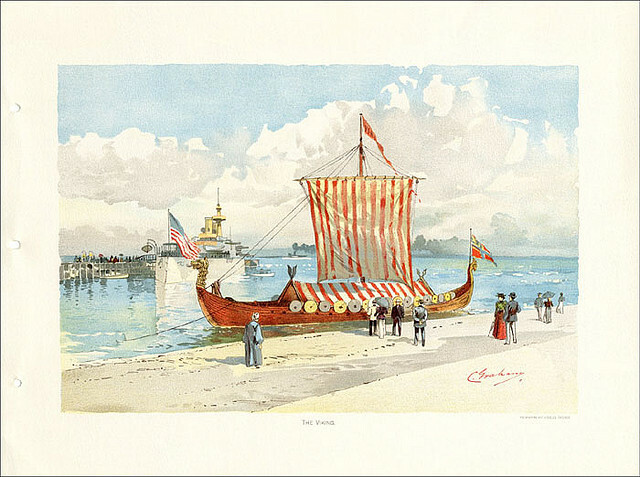 As if replicating a nearly 80 foot wooden ship wasn’t enough, Andersen then sailed the ship from Norway to New York City up the Hudson River to the Erie Canal through the Great Lakes and finally to Chicago for the World’s Columbian Exposition. Andersen’s exploits made waves both literally and figuratively at the Exposition and later as he sailed to New Orleans and back to Chicago. The ship is now housed in Geneva, IL just outside Chicago and is considered one of Illinois’ most endangered historical landmarks. Friends of the Viking Ship have stepped up to preserve the ship and are currently resolving legal ownership issues so they can raise money to permanently house the ship in a climate controlled facility. The ship is open to the public from 1 – 4pm this Saturday (September 15, 2012) as well as October 20, 2012. For more information, see the Friends of the Viking Ship website.